They sure were a happy bunch. My friend Linda Cohen, of 1000 Mitzvahs fame, and I spoke yesterday morning at the Tigard Breakfast Rotary club where we met 16 very joyful Rotarians. Even at 7am, it was a lively and seasoned group, well-versed in the art of laughter … and breakfast. Rotary International has been around for over 100 years, formed by a few friends in Chicago who felt that the mission of business shouldn’t be a predator of society, but a servant to it. That mission continues today with a global organization of 1.2 million members. Service has always been the noble goal of Rotary with current programs such as Polio Plus, a $500 million effort to eradicate polio; Rotary Youth Exchange, an exchange program for high school students; Rotary Centers for International Studies in peace and conflict resolution; Rotary Literacy, to promote worldwide literacy; Interact, a Rotary youth program to foster leadership and service. The list goes on. Even though the meeting was full of mirth, there was still serious talk about scholarship and polio-eradication fundraisers. One man talked eloquently about a younger Rotarian group of which he was a part, and how the spirit of service was being fostered in a new generation. There were also stories of support and companionship for fellow Rotarians and friends during their last hours on Earth. 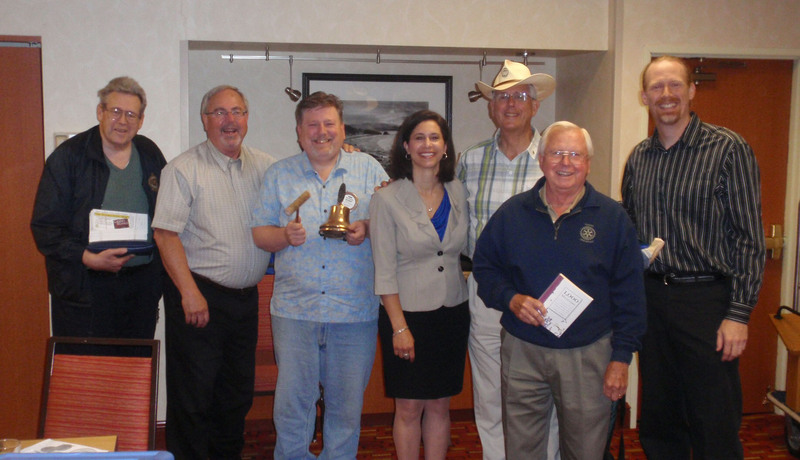 The Tigard Rotarians’ enthusiasm showed in their friendly banter, and attentiveness throughout our presentation. An attentiveness that didn’t waver much in spite of full stomachs from a hearty breakfast of french toast, thoroughly-enjoyed before the meeting. Morning munchies aside, this is a happy bunch. They are part of an organization with a century-long commitment to service. That commitment brings smiles to the faces of millions around the globe – and smiles to the faces of the members of the Tigard Breakfast Rotary. With service as their guiding force, they have a right to be happy. After all, they’re Rotarians. Yesterday’s gift of time … Spoke about giving time, kindness and mitzvahs with my friend Linda Cohen, author of the book 1000 Mitzvahs. This entry was posted in In the community and tagged community service, Rotarians, Rotary, Rotary International, Service, Tigard Breakfast Rotary. Bookmark the permalink. Just saw this tonight. Can’t wait to speak again with you Eric! Thanks for your friendship and expertise in giving. And many thanks in return, Linda. It was a lot of fun!